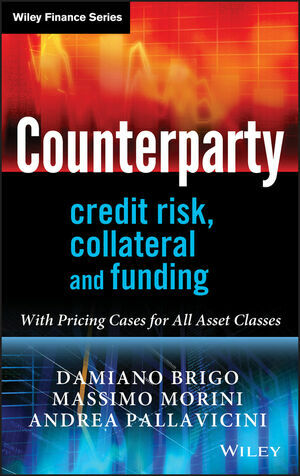 The book’s content is focused on rigorous and advanced quantitative methods for the pricing and hedging of counterparty credit and funding risk. The new general theory that is required for this methodology is developed from scratch, leading to a consistent and comprehensive framework for counterparty credit and funding risk, inclusive of collateral, netting rules, possible debit valuation adjustments, re-hypothecation and closeout rules. The book however also looks at quite practical problems, linking particular models to particular ‘concrete’ financial situations across asset classes, including interest rates, FX, commodities, equity, credit itself, and the emerging asset class of longevity. The authors also aim to help quantitative analysts, traders, and anyone else needing to frame and price counterparty credit and funding risk, to develop a ‘feel’ for applying sophisticated mathematics and stochastic calculus to solve practical problems. The main models are illustrated from theoretical formulation to final implementation with calibration to market data, always keeping in mind the concrete questions being dealt with. The authors stress that each model is suited to different situations and products, pointing out that there does not exist a single model which is uniformly better than all the others, although the problems originated by counterparty credit and funding risk point in the direction of global valuation. Finally, proposals for restructuring counterparty credit risk, ranging from contingent credit default swaps to margin lending, are considered. PROFESSOR DAMIANO BRIGO is Chair of Mathematical Finance and co-Head of Group at Imperial College, London. Damiano is also Director of the Capco Research Institute. His previous roles include Gilbart Professor and Head of Group at King's College, Managing Director and Global Head of Quantitative Innovation in Fitch, Head of Credit Models in Banca IMI, Fixed Income Professor at Bocconi University in Milan, and Quantitative Analyst at Banca Intesa. He has worked on quantitative analysis of counterparty risk, interest rates-, FX-, credit- and equity- derivatives, risk management and structured products, and funding costs and collateral modelling. Damiano has published 70+ works in top journals for Mathematical Finance, Systems Theory, Probability and Statistics, with H-index 24 on Scholar, and books for Springer and John Wiley & Sons that became field references in stochastic interest rate and credit modelling. Damiano is Managing Editor of the International Journal of Theoretical and Applied Finance, and has been listed as the most cited author in Risk Magazine in 2006 and 2010. Damiano obtained a Ph.D. in stochastic filtering with differential geometry in 1996 from the Free University of Amsterdam, following a BSc in Mathematics with honours from the University of Padua. MASSIMO MORINI is Head of Interest Rate and Credit Models and Coordinator of Model Research at Banca IMI of Intesa San Paolo. Massimo is also Professor of Fixed Income at Bocconi University and was a Research Fellow at Cass Business School, City University London. He regularly delivers advanced training in London, New York and worldwide. He has led workshops on credit risk and the financial crisis at major international conferences. He has published papers in journals including Risk Magazine, Mathematical Finance, and the Journal of Derivatives, and is the author of Understanding and Managing Model Risk: A Practical Guide for Quants, Traders and Validators. Massimo holds a PhD in Mathematics and an MSc in Economics. ANDREA PALLAVICINI is Head of Equity, FX and Commodity Models at Banca IMI, where he has the responsibility of numerical algorithm's design, financial modelling and research activity. He is also Visiting Professor at the Department of Mathematics of the Imperial College London. Previously, he held positions as Head of Financial Models at Mediobanca and Head of Financial Engineering at Banca Leonardo, he worked also in aerospace industries and financial institutions. He has a Degree in Astrophysics and a Ph.D. in Theoretical and Mathematical Physics from the University of Pavia for his research activity at CERN laboratory in Genève. Over the years he has written books in finance and he published several academic and practitioner-oriented articles in financial modelling, theoretical physics and astrophysics in major peer-reviewed journals. He teaches regularly at professional training courses and at Master and Ph.D. courses in finance at different Universities and private institutions. His main contributions in finance concern interest-rate and credit modelling, counterparty credit risk, and hybrid derivative pricing.